Regular grooming keeps your dog clean, healthy, and comfortable. Trips to the professional groomer can really add up and you can save some money by grooming your pet at home. Besides, grooming can be a bonding experience with your pet and we hope you enjoy this new skill. And once you master the basics, let your creativity flow and try out some of the more adventurous clips and shears. If your pet has a continuously growing coat, trimming every 6-8 weeks is ideal. If you are able to brush your pet regularly and prevent mats from forming, grooming is not as necessary, but if your pet matts easily you may need to clip the coat short more often. What is the usage of the scissors? Straight Scissors: The most popular of all scissors because they are made in a large selection of sizes and weights and have various blade lengths. Thinning Scissors: Used to thin out hair on a thick coat. They have one fine-toothed blade and one cutting blade. They will only remove some of the hair, thinning it out, rather than cutting it away. Curved Scissors: These scissors are curved slightly towards the tip of the scissors. They are needed to easily trim and shape the fur around the contour of the dog's body. 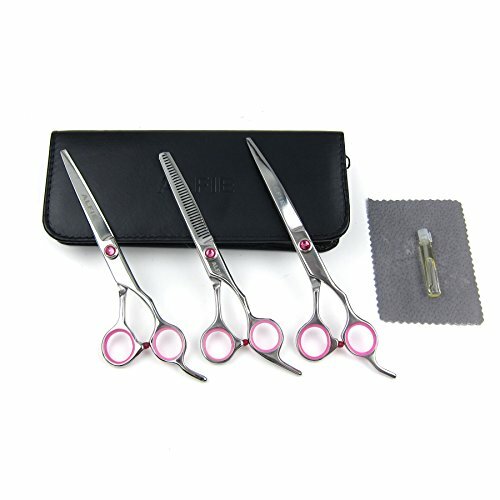 This 3-piece Grooming Kit includes 7.5-inch Stainless Steel Straight Edge Scissor, 7.25-inch 32-tooth Thinning Scissor, 7.5-inch Curve Scissor. Curved Scissors is especially useful on thick, curly coats. Ideal choice for Standard Poodle top knots and thick coated Bichon heads while the Thinning Scissors has a 25% thinning rate, great for removing tangles and dead undercoat. Scissors are precision weighted and balanced, offer unsurpassed balance, weight, and feel. Handles and finger rests are contoured for maximum comfort. If you have any questions about this product by Alfie, contact us by completing and submitting the form below. If you are looking for a specif part number, please include it with your message.